High tensile strength and do not cause any adverse environmental affects. Depending upon the manufacturing criteria both during weaving and coating, tarpaulins can be made in different weight categories as per square meters. Generally, it is made from100 GSM to 400 GSM. GSM is a unit to specify weight in grams of finished fabric or tarpaulin per square meters. Waterproof tarps typically come in ready-made sizes or rolls. Ready-made tarps vary but are usually available in sizes from 6 feet (2 meters) to 90 feet (30 meters). Polytarps are measured by two different sizes--the cut size and the finished size. Shrinkage occurs during the manufacturing and the finished size may be up to 6 inches smaller than the cut size. 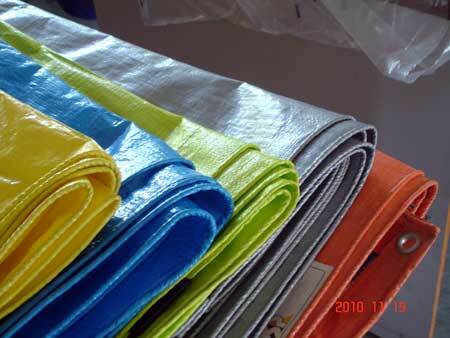 Roll sizes of waterproof tarps also vary and can generally be customized for the buyer. However, 200 meters is a standard length.